One more out the door to a happy player! No matter how many I make, there is always something special about bringing one of the babies to completion. It's always so great to see them like this - finished, strung up and ready to play! This is another mid-size guitar that I completed recently. It's interesting how few players ask for a dark finish these days. There's something sort of regal or majestic about a beautiful dark-toned wood. 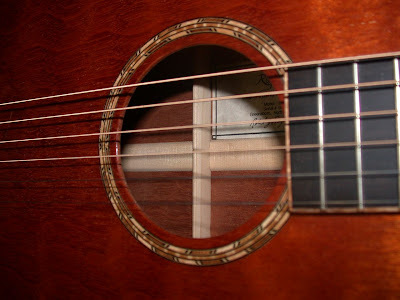 In this photo, you can also see another type of rosette that I do, and my signature can be seen through the sound hole. This is one of my mid-size guitars, just after the body's finish is fully cured. You can see I've still got some newspaper covering the inside of the sound hole. That's done to prevent the sprayed finish from getting inside the body. I finish my necks separately from the body for a number a reasons, but you can see in this photo that the neck is not yet carved down. I arranged the photo this way to show you part of the process, and to show off that inlay! It's a dragonfly sitting on a flower. 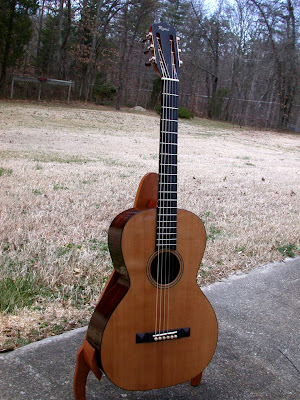 There's several different materials in it, as well as the fret markers and sound hole rosette. I've always loved a good inlay - the intricacy and artistry involved is a great creative expression. Ever wondered how guitars get such a great finish on them? Well, here's part of the answer! This picture was taken of my "spray booth", while two recently sprayed instruments were drying. 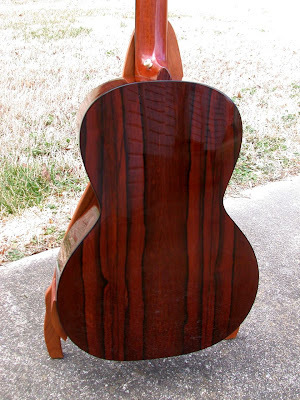 I've had lots of experience creating great finishes on fine instruments, and take pride in my work. 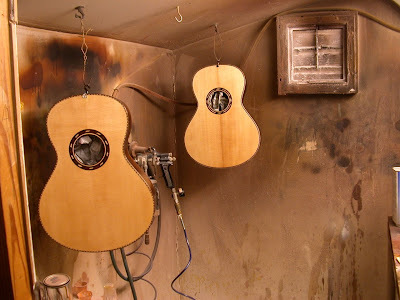 There's a fine balance between protection/durability and resonance when applying a finish. 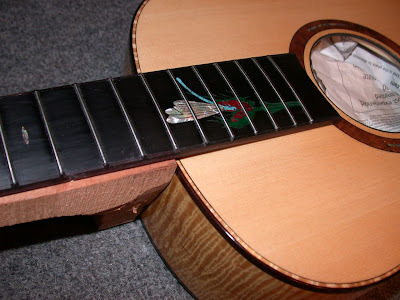 If you put too much on, it will make the guitar's wood not ring as much. But if you don't put enough on, you can end up with places that wear out over time. Most cheap guitar makers automate everything, and you end up with either a guitar that's got bare wood showing after a year of playing it, or a guitar that sounds like a ukelele because it's been gunked up with too much finish! That's one of the reasons I do all my finishes by hand.